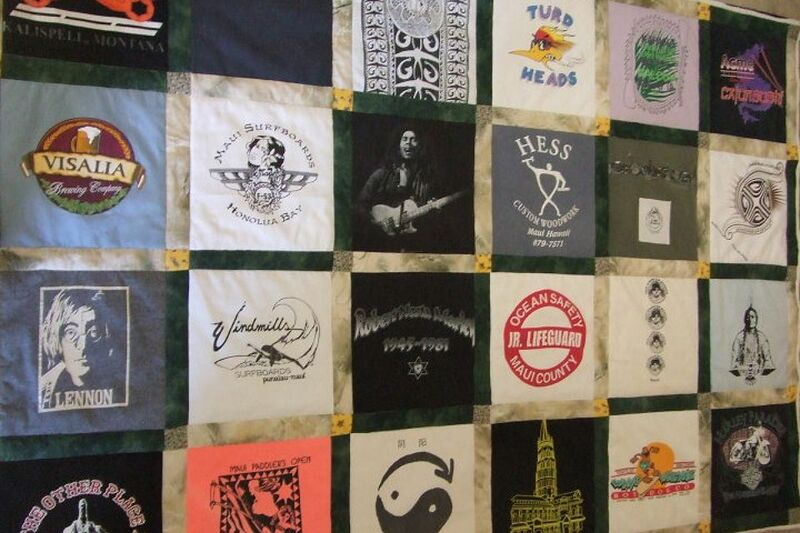 T-shirt quilts make wonderful memory quilts. Creating a quilt from much-loved shirts is the next best thing to being able to wear them again. You'll find plenty of inspiration in this gallery that's packed with pictures of shirt quilts. You might even be surprised by the wide variety of quilt layouts created by these innovative quilters. You can design a T-shirt quilt in nearly any way you wish, but there are a few little extras that need to be handled before the shirts are sewn into a quilt. You have to consider whether to use a stabilizer, how to cut the blocks, and what sashing and other patchwork you will use. These examples can help you decide how plain or fancy you can make the quilt. Some quilters use blocks of the same size while others put them together in artful arrangements. This T-shirt quilt was made by S. Glenn for a sibling on Maui. This T-shirt quilt was made by Barbara. It's composed of 34 swimming competition T-shirts. She met a couple at a fundraiser where one of her quilts was auctioned. They asked her to make a bed runner or couch throw, but they gave her enough shirts to make a heavy king-sized quilt. TJ's aunt Susie made this quilt enshrining interests including Captain Underpants and the Cubs. Cheryl made her first quilt ever using softball T-shirts earned by her daughter Lauren, who played softball from age 7 to 18. There are many memories and so much love in the quilt. Cheryl made this quilt for her husband, Ed. He coached their daughter and high school summer travel teams and loves this quilt. Marg made this and other special memory quilts from her son's button-down shirts and T-shirts after he died. They have been given to his friends. Each of the quilts is hand quilted, with detail on the shirt logos. This is another of the several quilts Marg made from her son's shirts after he passed away. You can see the details and creativity she put into these quilts. Nicky made this 90-by-90-inch quilt from 36 shirts. Peter was her friend's 40-year-old son who passed away from complications of diabetes. After he passed, his mom and sister sent her 36 of his favorite T-shirts and asked me to make a quilt from them. At the same time, she was learning to free motion quilt. When her husband wouldn't part with any of his old kart racing T-shirts, this quilter turned them into a memory quilt. The border is sewn in his favorite color and the best bit of luck was finding the checkerboard material to for the quilt's binding. The quilt travels with the couple to all out-of-town National Kart Races. Auntie Susie and her husband are both University of Illinois alums. She was thrilled to work on this T-shirt quilt for her friend's son. The Elk Grove Cheerleaders were state champions for five consecutive years. This quilt, a graduation gift, commemorates their accomplishment. It was also made by Auntie Susie. Joyce's adult son has been a NASCAR fan for a long time. He finally agreed to send her a couple of his T-shirts—but only a couple—so she had to be very creative with the quilt. She found the NASCAR cup fabric one day, just by luck. Then she went to a bookstore and found a NASCAR book that had the perfect pictures of Jimmie to add. Ginger's daughter is a competitive Irish stepdancer. These T-shirts were purchased at various feis (pronounced fesh), which are the dance competitions for Irish stepdancing. Ibereeree made this quilt of her granddaughter's T-shirts to go to her dorm room at the University of Mobile. Everyone loved her quilt. Jeremy's mom saved all of his T-shirts, beginning when he was a newborn in the hospital through his scouting years, baseball, high school choir, and drama club. She asked his grandmother Marcia if she could turn the shirts into a quilt. This is the result of Marcia's first T-shirt quilt project, made very simply with big blocks. Karen made this quilt for her daughter from her high school softball team shirts. This was extra special because her team won the Oklahoma 3A state championship and she was named an Oklahoma All-State player. This quilt was made for a breast cancer survivor who has been to many Race for the Cure walks and had a lot of T-shirts. This queen size T-Shirt quilt was given as a birthday present. The back of the quilt is sewn in shirts that are in memory of one of her friends. This Harley Davidson T-shirt quilt from Ojeda measures 96 inches by 116 inches. Auntie Susie made this quilt for a friend's mother, a breast cancer survivor, for Mother's Day. The T-shirts are from past annual walk/run fundraisers. Auntie Susie made this quilt from old cheerleading T-shirts. Donna's nephew Hunter is an avid baseball and basketball player. Since he has been playing since he was 5 years old, he had lots of team shirts. She used blank T-shirt backs for four patch blocks and attached championship patches on the appropriate blocks. It's a twin size quilt for his bed. Lorie made this T-shirt quilt for her son as he was leaving for college so that he would have some fond memories of Scouts, soccer, vacations, and more to take with him. Patti made this large quilt, 70 inches by 112 inches, out of T-shirts from places a friend of hers traveled with her late husband on their Harleys. Kim made this T-shirt quilt for her daughter Kelsey to take to college. Kelsey saved various T-shirts, chose the sashing fabrics, and then made a precise layout of where each block should go and with what fabric. It fits a dorm bed or a double bed. She also made a 27-inch pillow from the leftover T-shirts and fabric. Elizaniko made this T-shirt quilt made from her son's old shirts. Adam ran track and cross country in junior high, high school, and college. His mother made this quilt with a sampling of the T-shirts he got from the teams and races he participated in. Kathryn made this queen size, hand tied quilt from T-shirts of past and present Padre players. The quilt backing is navy blue. It is fiber filled. As Momof11's son was packing up to head off to college he brought her a stack of 25 or 30 T-shirts and asked her to make a T-shirt quilt. Some shirts had small logos, and so she pieced them together to make blocks the size of the larger shirt logos. The backing fabric was in her fabric stash. This T-shirt quilt was made for my Dawn's oldest son, Matthew. She gave it to him when he returned from a 2-year tour in Okinawa.